Protection from natural shockwaves through the foot, ankle, knee, thigh and hip joint is now available for Highland Dancers competing at the highest level. This amazing insole material actually swallows and dissipates 97% of the impact energy when your foot hits the ground giving a bounce to your dancing never before experienced. And all this in a shoe designed for every dancer from Beginner level to Championship winners. 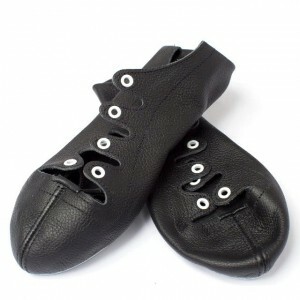 Now on sale for over 10 years, it was originally produced to combat the rigours of dancing on the heavy, solid surface of the Castle Esplanade during the Royal Edinburgh Military Tattoo, this Highland Dance Shoe is especially suitable for dancers who have been subject to the minor strains and injuries which come along when dancing through a heavy programme of demonstrations, competitions and regular classes or dancing on hard, heavy surfaces. The insole material has been developed in conjunction with major research organisations and raises vibration and shock absorbing qualities to new heights. So thin is the material used that it can replace the regular inner sole with virtually no loss of feeling or flexibility, and by being lasted into the shoe during the production process the shoe is as comfortable as your regular time-proven Forsyth 'Originalz' shoes. As a general guide, Forsyth shoes are designed to be worn a size below the UK outdoor shoe size. We would advise customers to ensure that their shoes are a tight fit when new, because there will be some stretching in the leather to allow the shoe to mould to the foot. This happens as the shoe warms to the feet. If the shoe is too loose when purchased then it will become too large. It is recommended that your new shoes are worn around the house as 'slippers' to help them mould to your feet. To further help in your shoe size selection below are the lengths of Forsyth shoes. This measurement is the approximate cm length along the sole of the shoe. *You will need to pay the initial shipping cost of the order ($5) and pumps returned must be in 'as new' condition, with clean soles. Have a question? Please send us an e-mail!